Tyler Lotz’s sculptures and vessels have been shown in solo and group exhibitions at venues including the Dubhe Carreno Gallery – Chicago IL, Cervini Haas Gallery/Gallery Materia – Scottsdale, AZ, Harvey/Meadows Gallery – Aspen, Co, Santa Fe Clay – NM, The Clay Studio – Philadelphia, PA, and SOFA Chicago. His work has been presented abroad at The First World Ceramic Biennale Korea and 2010 Vallauris Biennale Internationale in Vallauris, France. Tyler’s work has been acquired by collections including the Daum Museum of Contemporary Art, in Missouri, and the Icheon World Ceramic Center in Korea. Publications including Ceramics Monthly, American Craft, and the Clay In Art International Yearbook have featured his work. He has been an artist in residence at the Archie Bray Foundation in Helena, Montana and at the Watershed Center for Ceramics in Newcastle, Maine. Having received his BFA from Penn State and his MFA from the New York State College of Ceramics at Alfred University, Tyler is currently an Associate Professor teaching at Illinois State University. My idea for this new work contains two broad ideas that tie both to its aesthetic and its utility. The first tenet is that the work is simple, accessible and easily understood as to how it functions. Consequently, these vessels follow traditions of everyday commercial and handmade tableware. Finishing and Glazing will be clean and unobtrusive to the form. The second tenet is that the work’s inherent straight line geometry provides some impetus for a more complex engagement with the work. 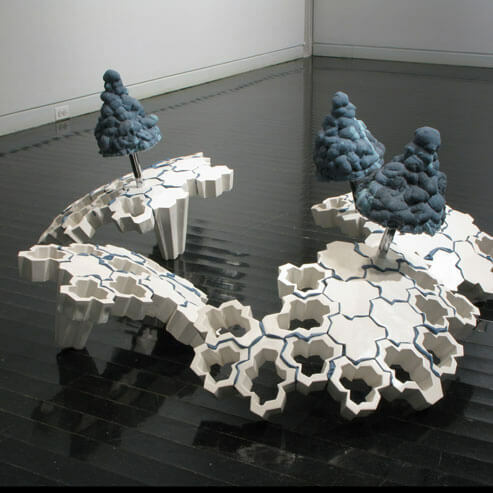 Arrangement of some of the vessels could be formed by the user to create tessellating or repeating compositions. Any ornament or pattern is tied to the form of the work rather than applied as a secondary measure. The formation of the works stem from a system of creating patterns for three dimensional objects using two dimensional flat materials. The two axis drawings of the vessels start as a profile and top/bottom view. Information from these views can be used to create an exact pattern to be hand cut and folded from a two-dimensional material, in my case sheet plastic. Rather than creating a positive from the plastic, I first create a negative mold form that is filled with urethane rubber. This flexible and durable rubber works great as a positive for traditional plaster slip casting molds.